The Bench-Mart SR provides full plant protection in an impressive, highly visible structure. It is designed to be a low-cost, modular, and movable sales building. It’s 17' width reduces parking space loss by covering only one row in most retail lots. Engineered for simplified setup, easy future expansion, and superior strength, the Bench-Mart SR is a complete package to quickly get you started. Bench-Mart SR comes with display benching brackets built in. Slide-Side ventilation keeps your customers comfortable. The Bench-Mart SR is our highest capicity seasonal retail greenhouse. The Bench-Mart SR contains built-in side and center benching brackets (bench tops packages available) to display your product in the best possible way. These high capacity built-in displays provide more benching area than standard block & plank. Choose from 2 different center benching styles: flat stacker or tiered. Hang baskets around the end door and on the opposite end wall for maximum display area. 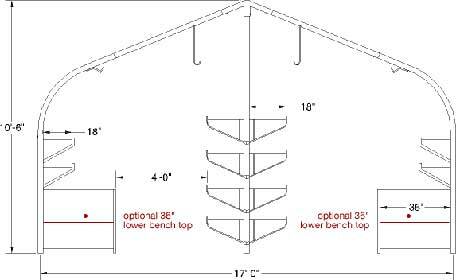 Four hanging basket purlins run the length of the Bench-Mart SR. Two are above the center benching and another two are above the outside benching. A choice of clear or white 6 mil. roof polyethylene with clear poly on the end walls. Our poly coverings are UV stabilized, and come with a four-year limited warranty. Choose from water tubes or spikes to keep your Bench-Mart SR secure and protected from high winds. A wide six-foot opening allows easy access to the Bench-Mart SR for your customers and carts. Covered in durable, twin-wall polycarbonate they stand up to the rigors of a busy retail environment.